I never explicitly intended to become an entrepreneur. In fact, I championed the idea for PitchBook for years at VentureOne—and I would’ve done it there if they’d allowed me to. Ultimately, I started PitchBook because I saw customers with a clear need and an opportunity to do something interesting. A few months into this journey, Rich Riley, CEO of Shazam and one of our earliest investors, asked me: “How committed are you to PitchBook? If you were offered a $200k salary right now to work at any company, would you take it?” About a year later, right after the recession hit, my mom called and asked if I was going to start looking for a job. It goes without saying that both times my answer was no. I bring this up because last week, one of our financial writers, Kyle Stanford, published a story exploring exits led by founders versus those led by professional CEOs. I think it’s relevant to acknowledge what the data didn’t (and many commenters did)—that more experienced CEOs are almost always brought in when a founder reaches their leadership capacity; thus a longer time to exit makes sense. In the past, time from founding to exit for venture-backed companies was understood to be around five to seven years. 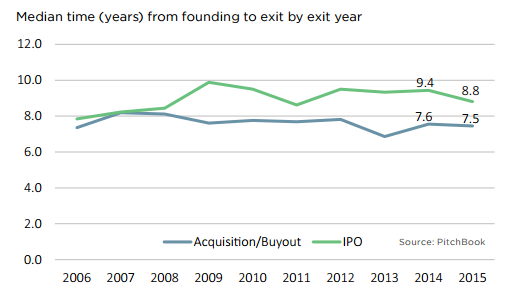 According to our most recent Liquidity Report, median time from founding to exit is now seven to nine years. This, coupled with concerns about valuations and capitalization levels, means that the expectation for a quick exit, a big check and the opportunity to do it again has become less of a reality for both founders and VCs. Here’s where this gets problematic: It’s generally understood that founders have a fiduciary duty to maximize value and return capital back to investors as soon as possible. In the past, many have done this by building their companies for a quick flip. But in a time when exits are slow (in a good year, we see about 2,500 exits, which represents about 7% of the VC-backed universe) and facing the near-term prospects of a more challenging funding environment, we’re seeing many investors evaluate potential investments the “old-school” way—via fundamentals. For founders, this can be a real challenge. It means our role is not to just start a company, but also to maximize the potential of the business; it means we have to truly be a founder and a CEO. And in most businesses, it takes time for fundamentals to take shape. For PitchBook, it took nearly two years to launch our first product; we didn’t have metrics for CAC, MRR, LTV, churn or NPS until a couple years after that first release. According to the PitchBook Platform there are at least 35,000 venture-backed companies worldwide. I’ll bet that most have been built without much infrastructure for scale, and as a result it’s likely that billions of dollars will be lost on companies that have been funded by venture, angels or crowdfunding within the last five years. So what’s the resolution here? I’m of the opinion that it would be wise for both founders (and their investors) to check their expectations. Embrace the role of CEO (if you can and actually want to), focus on building a fundamentally strong business, and hunker down for the long haul. This paves way for a different kind of startup. 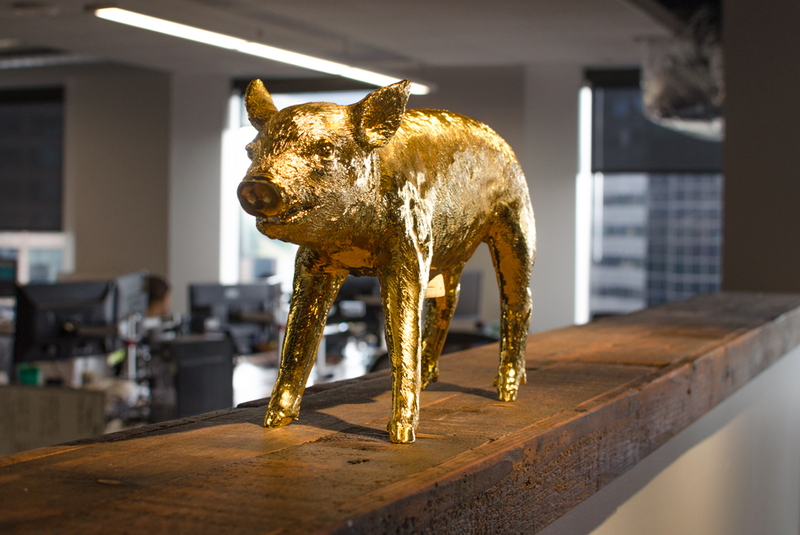 Putting it into context of PitchBook’s values, it’s one that artfully balances “customers are king” and “making it fun,” while making bacon (actual revenue and profit). It’s a company that invests in lasting systems and infrastructure from the start; it’s a company that has the ability to be a going concern. Being a founder is fun; running a business is challenging, and running a business in which you are emotionally and physically invested, even more so. But with any investment comes the obligation of putting it to work prudently. To be clear, I’m a big fan of venture. I love the opportunities that it creates and the cultural and technological shifts that have come out of venture-backed companies led by great founders. It just goes through cycles of getting carried away with itself, and I think it’s likely we’ve found ourselves in the middle of one. Making this right will require founders, VCs and their LPs to manage their expectations and exit day dreams, and instead focus more on building viable, fundamentally strong businesses that can survive long term. As Founder and CEO of PitchBook Data Inc., John Gabbert brings more than 16 years of experience in developing data and workflow technologies for professionals doing business within the global M&A, PE and VC spaces. Prior to founding PitchBook in 2007, he was the Managing Director of Private Markets for Dow Jones & Company and VP of Worldwide Research for VentureOne, VentureSource and The Private Equity Analyst. He has also played a key role in six acquisitions/mergers (three as the acquired target and three as part of the acquiring/merged organization) by both strategic and private equity investors. John attended the University of Washington, where he received his degree in business with concentrations in finance and marketing.